At Evans Carter Funeral Home, our experienced Family Service Representatives are trained to assist in planning services for all denominations and can help you with the questions you might have, such as whether you want a simple or elaborate celebration? Do you want a private or public viewing? What readings, musical selections, pictures or displays would you like to reflect your loved one’s life? Whatever your decisions are, it is comforting to know you have a funeral professional that will give you caring, personal attention. As you can see, planning a funeral involves many choices and decisions. That is why we encourage you to make your plans in advance. Pre-planning allows you to choose the type of service and merchandise you desire, and it relieves your family of the burden of making difficult decisions at a very stressful time. The price of funeral services and merchandise has tripled in the past 15 years. However, by pre-paying you can guarantee the price of the funeral service, no matter how long you live. 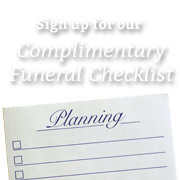 We have many convenient ways for you to fund your funeral plan. Remember, this is one of the best gifts a person can give to his or her family. Your Family Service Representative is here to help you with any and all concerns or questions you may have. Please feel free to contact us at (877) 294-2201. We are always available to answer your questions. Funeral arrangements often times take place within 24 hours of the loss of a loved one. Pre-planning for the funeral allows families that precious time needed to make decisions regarding funeral options without the emotional stress related to the loss. The act of pre-planning also allows for one to ease the burden regarding decisions and to make their personal wishes known. Starting the pre-planning process can be as easy as your first phone call. Your Family Service Representative will lead you through the pre-arrangement process. You can rest assured that our staff is attentive to your every need. We will answer any question that you might have and will never pressure you into any decisions. Do I have to pre-pay? The most important part of the planning process is just that, planning. You will be given the option of pre-paying, paying over time, or not paying and just making your wishes known. What are the benefits of Pre-paying? Like the cost of everything, the cost of funeral services go up over time. By pre-paying the funeral, you will have the peace of mind knowing that everything is taken care of and that your family will not have to worry about financial matters in their time of grief. What happens if I change my mind or I move? When you pre-pay your funeral expenses, the monies collected will be place into a revocable trust. You can change your mind and cash your money out at any time. If you move the money is fully transferable to any funeral home. If you have gone on Medicaid and the money was placed in an Irrevocable trust, the money may not be cashed out. But if you move away, the account can be transferred to funeral home in your area. Why should I pre-plan when applying for SSI/Medicaid? By pre-planning during the application process for SSI/Medicaid you will have the opportunity to plan and pay for a funeral out of your own funds, ensuring that the funeral services are to your exact wishes. If you wait until the funds are exhausted and you are relying on the Medicaid benefit to pay for your funeral, the Medicaid benefit is very limited and may not provide for the services you wish for. Do I have to come to the funeral home? Our funeral directors will accommodate you, whatever the need. Basic arrangements can be done at the funeral home, by phone and mail, and yes, we even make house calls.